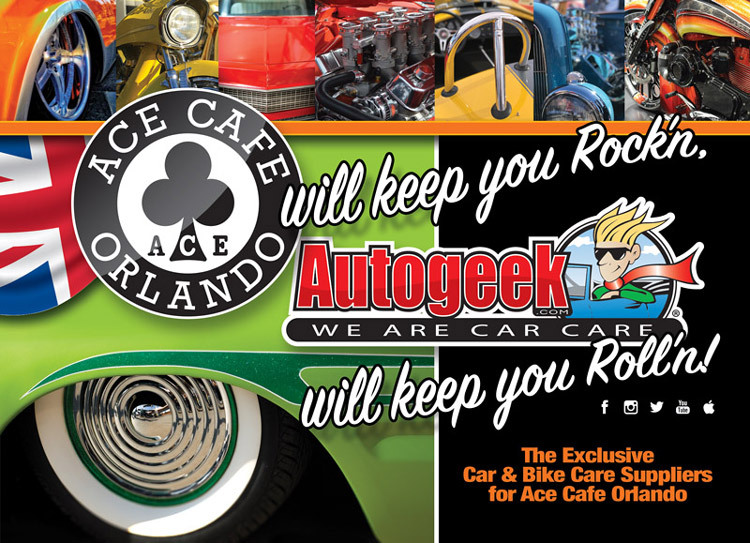 Autogeek is proud to announce our partnership with the world-famous Ace Cafe, specifically at their Orlando, Florida location. As the exclusive car and bike care suppliers of Ace Cafe, we look forward to joining them at their many car and bike show events! Originally built in 1938 in London as a roadside café catering to passing traffic, it’s close proximity to Britain’s then new and fast arterial road network, and the fact that they were open 24 hours, soon attracted motorcyclists. In 1939 the owner opened a service station with 10 gas pumps, a spacious washing bay, a showroom, and a repair shop. The end of World War II saw an increased traffic into Ace Cafe which slowly turned into the place for motorcyclists to meet, hang out and arrange runs, or often just to tool around on their bikes. Throughout the years, what started as a small roadside café in London has now led to the first US location in Orlando, Florida. Autogeek and Ace Cafe Orlando can’t wait to see what will happen next!